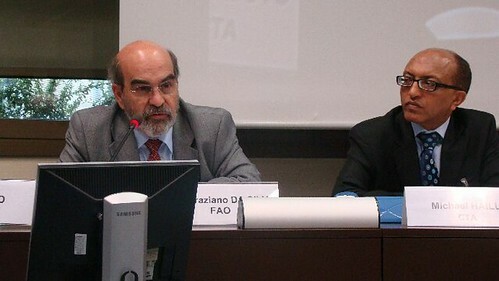 José Graziano da Silva of Brazil was elected Director-General of the UN Food and Agriculture Organization (FAO). Graziano da Silva, who is 61, received a total of 92 votes out of 180 votes cast, winning over former Spanish Foreign Minister Miguel Ángel Moratinos Cuyaubé, who received 88 votes. There were no abstentions. The election took place on the second day of the biennial 191 member nation Conference of FAO, which also will vote on the Organization's budget for 2012-2013. As Brazil's Extraordinary Minister of Food Security and Fight Against Hunger he was responsible for implementing the country's highly-successful "Zero Hunger" ("Fome Zero") programme, in whose design he also played a leading role. The programme helped lift 24 million people out of extreme poverty in five years and to reduce undernourishment in Brazil by 25 percent. Since 2006, he has served as FAO Assistant Director-General and Regional Representative for Latin America and the Caribbean. Graziano da Silva was born on 17 November 1949. He holds a Bachelor's Degree in Agronomy and a Master's Degree in Rural Economics and Sociology from the University of São Paulo as well as a Ph.D. in Economic Sciences from the State University of Campinas. In addition, he has two post-Doctorate degrees in Latin American Studies (University College of London) and Environmental Studies (University of California, Santa Cruz). Brazilian and Italian by nationality, he is married and has two children and two grandchildren. He speaks English, Spanish, and Portuguese. Graziano da Silva is FAO's eighth Director-General since the Organization was founded in Quebec City, Canada on October 16, 1945. The term of the new Director-General, who will succeed Senegal's Jacques Diouf, will start on 1 January 2012 and run through 31 July 2015. You can also read our newspaper “CTA Brussels Daily” (fed by our Twitter account), and follow our Facebook group CTABrussels and our Twitter account CTABrussels to receive up-to-date information on EU-ACP events. “We have accomplished 98 percent of what we had set as our objectives,” Hungarian Prime Minister Viktor Orbán said, during his evaluation of the Hungarian Presidency’s performance in Brussels, at the 23-24 June 2011 meeting of the European Council. The heads of state and government of the EU have already made an economic decision in the first day of their meeting. The Hungarian Presidency took a large part in the EU’s fight against the economic crisis: for the first time, it has launched and managed the EU’s new economic coordination mechanism, the so-called European Semester; and concerning the matter of the package of six legislative proposals aimed at reform of economic governance, it has brought a political agreement equally acceptable for the European Parliament (EP) and to Member States within reach. In the press conference, closing the first day of the Union summit, President of the European Council Herman Van Rompuy announced that the European semester has been closed. “We endorsed the recommendations of the Commission to the Member States, without -- and I insist -- without watering them down,” Mr Van Rompuy said. A G20 farm deal agreed on Thursday is a good initial effort to tackle food price volatility and fight shortages and should encourage investment in agricultural output, France's agriculture minister said. "This is the way I see this agreement. A first step, a positive step, and also an impetus that has been given to investment in agriculture," Bruno Le Maire told Reuters Insider TV shortly after G20 farm ministers agreed an action plan to curb food price volatility. Nuclear waste exports to countries outside the EU should be prohibited, unless exported for recycling and imported back into the EU, and even within the EU should be permitted only when governed by bilateral agreements, said Parliament on Thursday. MEPs also backed stricter rules for protecting and training workers, called for stronger investigatory powers for national authorities, and said research on alternatives to burying the waste deep underground should be stepped up. Under the proposed directive, each Member State would have to devise policies and programmes to ensure that spent fuel and radioactive waste is processed and disposed of safely. National policies would have to include inventories and management plans for all facilities, even after they close down. Romana Jordan Cizelj (EPP, SL), who drafted the resolution, said during yesterday's debate that "The European Parliament has several times called for a directive on the processing of radioactive waste and spent fuel and events in Fukushima showed we were right to do so. We are positive about the idea of a directive and we want this directive to be stronger and clearer". The resolution was passed with 489 votes in favour, 52 against and 75 abstentions. MEPs want to keep the EU agriculture budget unchanged until 2020 so that farmers have incentives to provide secure food supplies, environmental protection, create new jobs and provide for a competitive EU farming sector. Ahead of Commission proposals on the future of the Common Agricultural Policy the Parliament is staking out its position for the next long-term budgetary period, running from 2014 to 2020. In response to rumours of cuts in aid for rural development, MEPs stressed their support for adequate funding for this area. "The vote sends a clear, strong signal to the commissioner [Dacian Cioloş] and I hope the Commission will bear in mind what we have put into the report and incorporate it in the final legislative proposal", said Albert Dess (EPP, DE), who drafted the resolution. 60 European vessels will be allowed to catch fish in the waters of Seychelles from 2011 to 2014, with another 40 vessels in the waters of São Tomé and Príncipe, according to an agreement that the European Parliament approved on Thursday. The agreement with São Tomé and Príncipe will be valid until 2014. Over the next three years, the EU pledges to give 450 000 € per year as a compensation for European catches: 65€ per ton paid by the EU, with another 35€ per ton paid by the fisher. The EU guarantees payment for a minimum of 7000 tons a year. Another 227 500 € per year is meant as a support for sectoral fisheries policy. Altogether, agreement will be worth 2 047 500 €. For every ton exceeding the annual quota, the EU agrees to pay 130€. The EP rapporteur Luís Manuel Capoulas Santos assures that “overall, the agreement accounts for 0.36% of total catch of target species stocks: in no case does the catch of Community vessels under the agreement account for more than 0.55% of total fishing of the stocks concerned”. The protocol with Seychelles concerns a catch volume seven times higher than in São Tomé and Príncipe. The EU pledges 3 380 000 € per year for 52 000 tons of catches (65 € per ton paid by the EU with another 35 € paid by the fisher), and another 2 220 000 € per year to support Seychelles’ fisheries and maritime policy. The protocol’s value thus amounts to a total of 16 800 000 € over three years with a pledge of 130 € per ton for catches exceeding 52 000 tons per year. If the Council does not oppose the decision of the Parliament, the agreement can become law. EU environment ministers on 21 June adopted conclusions on the EU 2020 biodiversity strategy, tabled by the Commission on 3 May, but were unable to endorse 20 concrete measures accompanying six headline targets proposed by the EU executive. After a lively public debate on the draft conclusions, ministers rubber-stamped the strategy, together with its targets, as "a key instrument to enable the EU to reach its overall 2020 headline target". The 3101st Council meeting on Foreign Affairs held in Luxembourg on 20 June 2011 approved the EU's priorities, with regard to peace and security, environment, sustainable development and human rights, for the 66th session of the United Nations General Assembly, which will start in September (11298/11). The Treaty of Lisbon reaffirms the EU's commitment to the principles of the UN charter, calling for multilateral solutions to common problems and challenges. To contribute to the achievement of this objective, the EU will continue to strive to build a stronger multilateral system, notably by enhancing the representativeness, transparency, accountability, efficiency and effectiveness of the United Nations. In this regard, the EU will actively engage in the reflection started in the General Assembly on the role of the UN in global governance. The EU Commission has approved fifteen million dollars in budgetary support for Dominica under its 9th European Development Fund (EDF). National Authorizing Officer for the EDF in Dominica Eddie Lambert, says the monies which is expected to be deposited into the governments accounts at the Eastern Caribbean Central Bank within the next three to four weeks, is tied to certain performance indicators. These principally include the land tenure and administrative reform programme which seeks to rationalize the sale of land in Dominica…customs reform targeting the amount of time it takes to clear goods at the customs and increasing the efficiencies of the registry. A special report assessing the potential of renewable energy sources against climate change, to which the JRC has contributed, was launched by the Intergovernmental Panel on Climate Change (IPCC) on Thursday 16 May in Brussels. The paper reviews, through various scenarios, the contribution of six renewable energy technologies in mitigating climate change over the coming decades. It also considers environmental, social and economic impact related to the implementation of these technologies. JRC researcher Arnulf Jaeger-Waldau contributed as a lead author of a chapter on direct solar energy. The other five sources considered in the 1500 page long report are bioneregy, geothermal energy, hydropower, and ocean and wind energy. The report further explored the integration of these energy sources in the current and future energy systems, as well as their role in sustainable development. Finally, authors analysed the mitigation potential of the renewable energies, their growth and cost. On June 22 and 23, the G20 Agriculture Ministers will meet in Paris to make progress on key issues such as reducing commodity price volatility, limiting financial speculation and establishing a global action plan against food crises. According to Olivier De Schutter, five priorities may give this G20 summit a vital role in improving long-term global food security. Will they be endorsed and implemented? The Netherlands will pay more attention to the fact that governments of developing countries contribute their share to help returning nationals. These are aliens who are not allowed to stay in the Netherlands after an unsuccessful application for asylum or after illegal residence. This is the decision of the Council of Ministers following a proposal by State Secretary Knapen (Development) and Minister Leers (Immigration and Asylum). The Netherlands have set aside 9 million EUR per year to help developing countries in matters of migration and development. If a developing country refuses to cooperate, this could have consequences for bilateral cooperation and the development relationship with the government. The government wants to help former asylum seekers who voluntarily return to their country build a new life. This can be done through the attribution of money, but it can also be achieved through training or help to find work. The Netherlands and other European countries want to work towards the creation of adequate shelter facilities in countries of origin and towards an effective tracing of underage migrants’ relatives. Former asylum seekers who do not go back voluntarily, can be forced to leave. It is important that the countries of origin support this by issuing temporary travel documents. In the European context, the Netherlands want to work on combating illegal migration and promote the safe return of migrants to their own region. For the period 2011-2013, Brussels has earmarked 179 million EUR for migration and development in developing countries. The Netherlands will urge that funds remain available beyond 2013 to assist developing countries in the return of migrants. A news report form Panama says that the European Commission is warning of sanctions to be implemented against Belize, Panama, Honduras, and the West African nation of Togo. That's because the commission says those countries are not cooperating in the effort to combat illegal fishing. The European Commission said it is committed to implementing the embargo on imports of seafood products from countries that it calls 'uncooperative' in the effort at combating illegal fishing. The problem it seems, lies with Belize's high seas fishing fleet, 128 Belize registered vessels. The EU has taken the position that Belize is unable to effectively control or monitor that fleet - and that this country should close it down. Director of Fisheries in Belize Beverly Wade told us that the issue came to the fore last week when the EU Commission met with fisheries minister Rene Montero. She says Belize has not been given anything formally - and it has not been provided with any basis for the classification. But, the embargo does not take effect until the end of September - so there are remedial measures that Belize should be able to take before then. The EU has given a deadline of the end of July for a formal response from the government of Belize. Domestically not much fisheries products are exported to the EU - but there are shrimp farms that export to that market. And if Belize is blacklisted by that trading block there is the possibility that others could follow. The Council confirmed today that the EU is fully resuming development cooperation with the Republic of Niger, following the country’s successful democratic transition and return to constitutional order (11266/11). "I am very satisfied with the return to democracy in Niger, through a very successful process of transition," said Catherine Ashton, High Representative for EU Foreign Affairs and Security Policy. She assured the newly elected authorities that the EU is determined to support their efforts to overcome the challenges they face, in particular regarding security and development issues. EU development cooperation with Niger was suspended in 2009 after former President Mamadou Tandja unconstitutionally attempted to remain in office beyond his second term. The EU considered this as well as the subsequent military coup in February 2010 a breach of democracy and the rule of law, essential elements of the Cotonou Agreement between EU and ACP states. Niger’s return to democracy was supported by a gradual resumption of EU cooperation. With the investiture of Mahamadou Issoufou as new president in April, the country has completed its democratic transition and fulfilled all commitments made during consultations with the EU. Today’s Foreign Affairs Council therefore confirmed full resumption of EU development cooperation with Niger. The European Commission welcomed today’s announcement: "On top of the ongoing support to Niger's economic stability, food security and transport infrastructure, today's decision will allow helping the country facing the new challenges of development and security in the Northern region. Most cooperation projects that were suspended have already been resumed and the procedures for approving new projects amounting to € 87 million are in very advanced stage", said Andris Piebalgs, EU Commissioner for Development. He added that Niger had also become eligible for the EU’s Millennium Development Goals Initiative, focusing on the welfare of the poorest people. The international charity ActionAid warned G20 ministers that the world is one bad harvest from a recurrence of the 2008 food crisis. It urged Agriculture Ministers meeting in Paris this week to take urgent action to stabilise food prices, including slashing biofuel production and mobilising a system of regional food reserves to help buffer the worst hit. High oil prices, an increase in biofuel production, commodity speculation and a lack of political leadership means that as many as 34 million people are at risk around the world from poverty and hunger if prices continue to rise. With countries like the U.S. imposing biofuel mandates that are steering 40% of its corn crop to producing biofuels instead of feeding people, and the European Union massively increasing its biofuels demand under new targets, the era of food surpluses is over. The ministers must act now to reverse the targets and financial incentives that are driving biofuel production. On 20 June, the European Commission adopted a Communication preparing the ground for the EU's position at the Rio+20 UN Sustainable Development Conference, which will be held in Rio de Janeiro in June 2012. The Communication outlines objectives and specific actions on the two inter-linked themes of the Conference: enabling the transition to a green economy in the context of sustainable development and poverty eradication, and ensuring better governance for sustainable development. Environment Commissioner Janez Potočnik and Development Commissioner Andris Piebalgs presented the Communication jointly, marking an important link between environment and development. [...] Andris Piebalgs said "Developing countries are the first affected by climate change and degradation of the environment. Floods, drought, and earthquakes are the most visible effects. They put at risk the economic and social development we strive to trigger through our assistance. Rio+20 is the opportunity to secure political commitment to improve the well-being of millions of people. We need to shift towards a green economy that will help us achieve sustainable growth which benefit to all citizens." The Communication maps out the "what, how and who" of a transition to a green economy, proposing specific actions that could be implemented at the international, national and regional levels. A proposed objective to cut the EU's transport emissions by 60% by 2050 was considered "too ambitious" by a majority of the bloc's transport ministers, who stressed that the goal should remain aspirational. Meeting in Luxembourg on 16 June, the EU's 27 transport ministers cautioned that the European Commission's proposals, outlined in March this year, should not disadvantage European companies compared with their competitors in Asia or the US. Peter Vis, the chief of staff of EU Climate Commissioner Connie Hedegaard, has broken with protocol to warn that the European Commission's draft Energy Efficiency Directive could "undermine" the bloc's carbon market. It is extremely rare for Commission officials to comment on draft EU laws. But staff in the climate department are privately fuming that new efficiency regulations, due on 22 June, would apply not just to buildings and vehicles, but industrial sectors already covered by the EU's emissions trading scheme (ETS), which puts a price on carbon by placing a limit on CO2 emissions. The work will focus mainly on grain markets (wheat, rice, corn and soya bean) because they are key commodities for food security. The European Investment Bank, the European Union’s long-term lending institution, has formally agreed to provide a EUR 60 million loan to enhance public and private sector operations by the West African Development Bank (BOAD). Finance contracts for the project were signed at the European Investment Bank headquarters in Luxembourg by Philippe Maystadt, President of the European Investment Bank and Christian Adovelande, President of the West African Development Bank. The European Investment Bank funding will focus on supporting regional projects that promote economic integration in West Africa, including environmental schemes or renewable energy. The West African Development Bank is the development finance institution of the West African Economic Monetary Union (WEAMU), with operations in eight West African member states Benin, Burkina Faso, Ivory Coast, Niger, Senegal, Togo, Mali and Guinea-Bissau.